It’s the 4th week of her 7th month now. “So, how’s is this girl doing?” You might asked. 4) She wants to walk. She loves to walk. She prefer to walk on her own, rather than being carried by anyone of us. Walk, Walk, Walk! ” Pretty women, Oh, walking the street, Pretty women!” haha……. Heard this b4? Like it? And, did I mention chicky? Yeah! Elizabeth is extremely playful and tricky as well. Don’t believe it? See how she reacts when I place a handkerchief on her head…..
Is this smile chicky enough? How about another shot? Elizabeth has stop breast feeding completely since I was back from KL. Actually, I only feed her once on BM since her 3rd week of her 6th Month. And, she started taking formula milk from the beginning of her 6th month. I thought she’s allergic to cow’s milk? Yeah! Once upon time, she was allergic to cows milk. But, she seems alright now. No more allergy problem! I did found the right formula for her! Huray! I’m truly ( may be it over?) concerned about her food once she was detected with allergy problem. Just as I mentioned in my previous post, she’s almost a fully organic baby. And,Why I’m so into organic food? Other than fresh vegetables, right from her formula milk to her ready made baby food like fruits purees, and even her syrup are all organic. 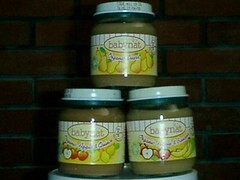 Most of these baby food are from Babynat. 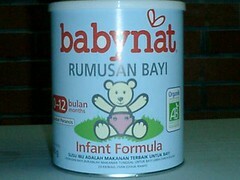 To me, Babynat is highly recommanded for all the babies , especially it’s formula milk. Elizabeth is taking it’s cow’s milk formula now. And, it does impressed me that Lizzy has no allergic reaction at all. She’s just fine, yet, she manage to poop everyday too. Why is it so good? I think most probably because, Babynat do mix it’s cow’s milk formula with substantial amount of vegetable oils. Thus, even baby that allergic to cow’s milk like Elizabeth is still safe to consume. By tasting this formula, you would certainly find out that it’s not that rich in cow’s milk. Yet, all the nutrients needed by babies is added. And, most importantly, Elizabeth do like it! I am very happy to find a formula like this. Really! For the fruit purees from Babynat, I found it very professional as it will clearly states in the label the percentage of certain fruit and where does this fruit come from. For instance, if it’s the “Apple and Blueberry”, under the Ingredients, it will states : Apples from Italy 80%, blueberries from Sweden 20%. Why I don’t make the fruit puree my own from organic fruits. I did sometimes. But, only for avocado because it’s good for baby, yet, is not in the Babynat range. Otherwise, fresh organic fruits are very expensive. And, ask me if I prefer to get the ordinary fresh fruits (which were filled with many types of chemicals) to make my own purees, or rather get the ready made organic purees, I certainly prefer the ready made. There is another concern on why ready made. I don’t like to process Elizabeth’s food using blender, to me, vitamin C would easily oxidize, yet, because of the heat, some other nutrients might have gone too. Thus, not much differences from the ready made. Yet now, the ready made is organic, certainly better than just homemade. Haha…… I sounds like owning one organic shop, don’t I? Frankly, I am still looking forward for the organic poultry. But, I think I just can’t get it in Penang, at least for the moment. However, no doubt that organic is good, just it’s mostly over priced. Don’t you think so? This is something I found in the Baby Centre about a week ago. And, I Found it interesting and being very useful to me and might be really useful for any of you that has little ones around too. Thus, I decided to blog on it — LENA SYSTEM. However, this analysis is only applicable for your 0 to 3 years old. And also, Some studies have proved that, simply talking with your child is more powerful than any combination of flashcards, computer programs, television or DVDs. But the quantity of words your child hears every day from birth to age 3 is critical. If you manage to speak 30,142 words per day to your baby before he or she turns to 3, this is what happen……. His or her IQ can scores really high, at least up to 110 and above. Generally, the greater the amount of language experience, the higher the IQ. Surprise? Excited? Check this out for more details. Look at this girl. I think She was out of my blog sphere for almost a week. Do you miss her? Here she is! Just have a look at how this naughty girl showed her piggy face…. Sometimes , I felt God really loves me so much by sending such a lovely girl to my life! Today, Elizabeth is already 7th months and 2 days old. And, She is growing up so fast now, not in terms of her physical, but in term of her Intelligence. She can response to a lot of things now. And, She start to learn up things that being taught by anyone of the family member. For instance, my mum used to teach her how to do “I am Elizabeth”by showing her, how to place her hand on her chest and slightly tapping her hand on it, indicating ” I am Elizabeth”. However, for the past two weeks, her response was only smile, every time she heard of “I am Elizabeth.” Yet, did nothing. Also, there are lots of facial expressions for her now. And, all those funny and chicky sounds started to come out from her mouth. And, She is super duper playful now. But, the main point is, she learns how to play on herself, talk to herself and know how to flip her book on her own too. Check this out! I love it! See, she talks and play on her own now…. And, She can even flips her books…..
See…..She learned how to get up from her sitting position now by kneeling …..
Also, do you realized she really like to smile? That’s because she enjoys taking photos (since her 5th months). Mummy kind of proud! It’s such a wonders to see her growing up…… And, all her positive developments truly pays off all my effort and love. By now, I am so glad I chose to be a SAHM.